King 5 news came up to WWU to interview Robin and Rachael about snow algae and the Living Snow Project. *The journalist took some liberties in his interpretation of what I was saying, as happens. I’m definitely NOT the first person to study snow algae. I was the first to start characterizing the communities using new DNA sequencing methods in 2014 when I started the study. Since then Trinity Hamilton at the University of Minnesota and Shawn Brown at the University of Memphis have published small studies in Oregon and Washington respectively. We are excited to have our large scale study in review for publication soon! The Living Snow Project was the cover story of the Sunday edition of the Skagit Valley Herald Memorial day weekend 2018! National Citizen Science Day is coming up! 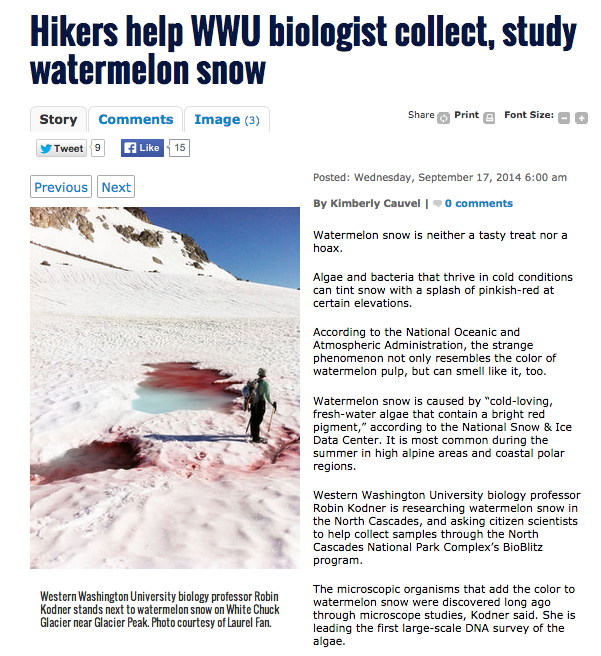 Check out this Seattle Times article on the Kodner Lab’s Citizen Science project. The Seattle Times highlighted Dr. Kodner’s Citizen Science program in a recent article about programs throughout Washington state using citizen scientists to track the effects of climate change. The WWU Alumni Magazine – Western Window – Featured Dr. Kodner as one of the scientists at WWU doing research on Mt Baker. The Outdoor Journal wrote an article with John All on the course he co-taught with Dr. Kodner in Peru last year: Outdoor Journal Article on Peru Course. 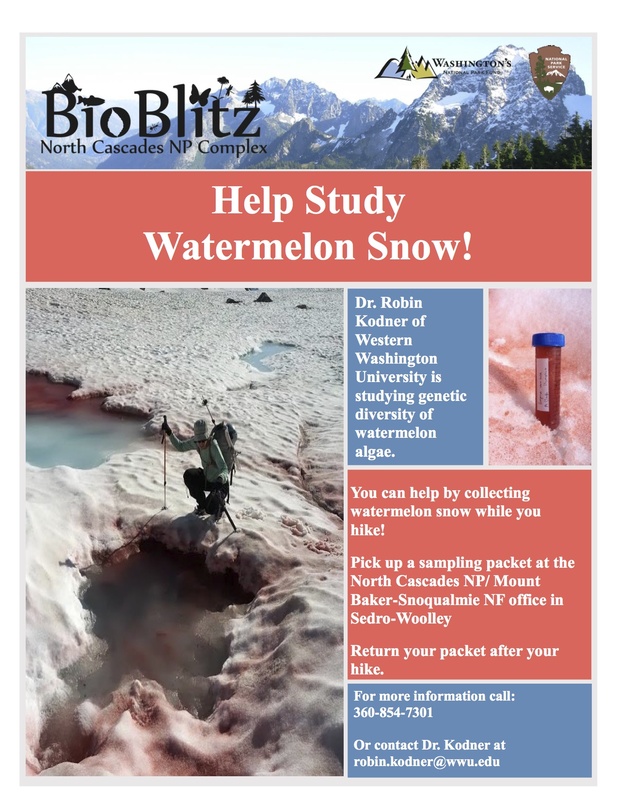 The Kodner Lab’s station at SnowSchool mentioned in an article in Cascadia Weekly. SnowSchool is a collaboration between the North Cascades Institute (an affiliate of WWU) and the Mount Baker Ski Area which brings place-based education about our local snowy and montane backyard to local K-12 students. Thanks to SnowSchool director, Abby Sussman, for the wonderful article! The Skagit Valley Herald featured Dr. Kodner and her involvement in the North Cascades National Park’s BioBlitz program: http://skagit.ws/1BMGFEy. This summer we began a true pilot of our Snow Algae sampling program. We have been partnering with the National Park Service to recruit citizen science volunteers to help sample. See the flyer below. We have also filmed sampling up at Mt. Herman and Artist Point in August, at the end of WA Hwy 542, for a Discovery Science documentary highlighting organisms that live in extreme environments. Thanks to Windfall Films for a fun day in the field!